There was an owl in my backyard all day that had moved to different areas throughout the day. My son and I went to look for her around 8pm. When we found her, her eyes were only half open and didn’t move when we got close to her. I got a towel and gloves to gently picked her up bringing her into the enclosed porch of the house. Gave her colloidal silver water from a dropper and got her to drink some. Within 10 minutes her eyes opened up wide. Left her in my porch overnight to be protected from the outdoors. The next day tried to feed some food and more water. Held her in my hands and then she crawled up and rested on my left breast. Went into a deep meditation of purity and love. She crawled up to my shoulder and went to sleep there for 15 minutes. She was very comfortable on my body with my warm heart. Message of the Owl … When an owl totem animal appears to you, it’s an omen that many will come to you for your knowledge and wisdom and your secret or shamanic powers. The owl is one of the most ancient signs for spirit contact. It’s appearance now is alerting you to much spiritual activity around you. Spending many hours writing a book right now, thanks owl! 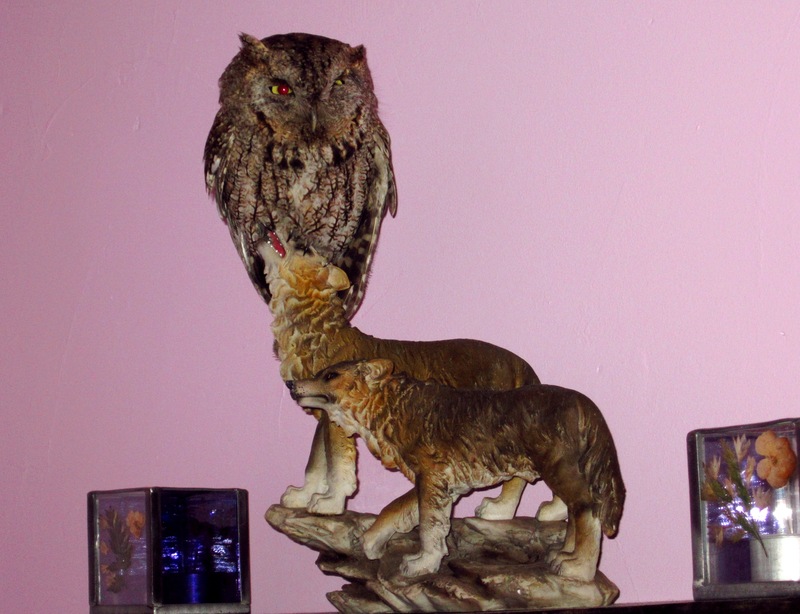 The owl liked to sit on top of my wolf statue high up on the wall and here she is winking at us with her left eye. This was one of the most incredible and important experiences of my life. The owl was eating earth worms from my hands by the second night, about 8 of them. Mother love poured out from me as I felt there was hope for her. We enjoyed a meditation for over 30 minutes while she sat on my left shoulder again. 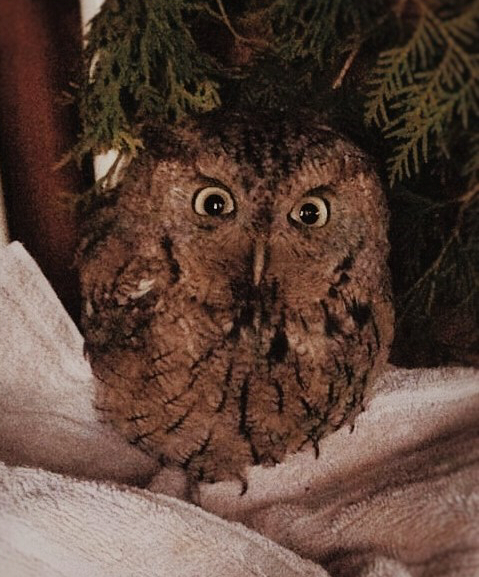 She is a screech owl and these links will let you hear her sounds. Her first hoots were heard by the second night just before I fell asleep and sounded like the territorial trill. ← How Much Time is Devoted to your Personal Healing and What are your Limitations?